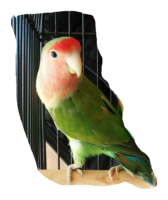 Peach is a Peach Faced Lovebird. Is 1 year old and is not tame. Bites very hard and loves millet, flys very fast and is a very good flyer.